You must make bookings at least 5 minutes in advance of the time at Indian Moment – Battersea Rise. Booked for last-minute dinner with family. Meal was great: one of best Indian restaurant we enjoyed! Decor & atmosphere very nice: a bit buzzing, but not too much. Service was slightly surly, not super friendly or welcoming, but was overall OK.
Great food, service good some staff really great others average! Bev and I visited our favorate Indian restaurant on Thursday night. It was pleasantly busy and we enjoyed a lovely evening. We would thoroughly recommend this restaurant. Joseph and his colleagues always look after us and the food is varied and excellent. We look forward to our next visit. Food was excellent. We both enjoyed all dishes that we ordered. Service was very good too. They found us a table within about 10 minutes even though the place was packed and we were about alf an hour early for our booking. Reserved in advance with confirmation. Turned up and was told rudely that reservation was cancelled with no prior warning. Strongly recommend people do not visit. Really great food as always. Very fresh indian food bursting with flavours. Only slight niggle was table was cramped and in general tables are squeezed tightly. I guess this way more of us get to enjoy their food! My meal was just okay, the sauce was a pretty oily and not appealing to eat. My partner's Chicken Tikka Marsala was good. Service was surly, not super friendly or welcoming. Decor & atmosphere very nice. Have to admit I've walked past it many, many times and marvelled at the name (to me it sounds like an exotic loo freshener) the decor is pretty uninspiring as well but the food......was fantastic. Went for an evening with a few friends and everyone was saying it was the best curry they'd had for some time. service was quick and attentive. good suggestions if you need help and they're happy to tweak any of the dishes to suit. Really, really recommend.........and sorry for being rude about the name but it stopped me going for years, my mistake. Lovely food at this restaurant, but it’s very cramped and they could do with more space.. we always liked the food and think the old restaurant had a better layout and was less cramped. My wife and I visited Indian Moment in Battersea Rise on Saturday night and enjoyed an excellent meal. The staff have become our friends and we look forward to our visits. If you haven't already tried this restaurant we thoroughly recommend it. We have visited many Indian restaurants over the years and can honestly say that this is the friendliest we have been to. The first time and we were not disappointed the service was good and welcoming and the food was very good would recommend. Excellent food. Worth the trip. Great staff. Accommodated us for late lunch x4 @3pm even though no one else there. Will definitely return. Great get together with friends from our Bajan cricket tour. Even though we had dinner at 8pm place was packed. Only downside was we were right at the back of the restaurant outside the kitchen so everything and all the staff had to keep passing us. Was also quite warm outside the kitchen. Food was fab and would go again but ask for a different table. The quality of the food is very, very good at this Indian restaurant. We have been a couple of times in the past and will certainly be going again. The quality of service is not outstanding, but adequate, so would probably not use for a special occasion. Delicious food and great service. Highly recommend the chicken dhansak and prawn methi! Something went very wrong with the booking system. Ended up not getting seated for an hour. Remedied by free bottle of wine and very apologetic staff. Restaurant not very big. Noise level horrendous. Food was excellent. Starter platters a bit on the small side. Friendly service and tasty food. Will definitely be back. Indian Moments is a great find. 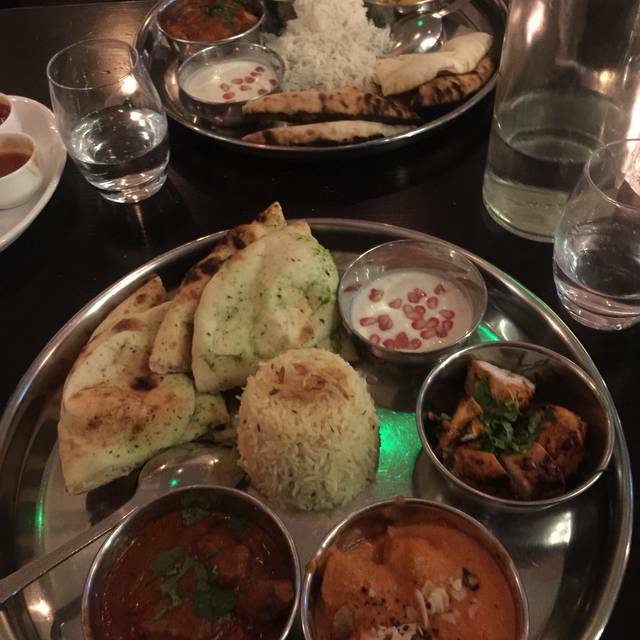 A number of us — all long-term curry fans — have formed a Curry Club this year, and so far we have only booked Indian Moments as each and every one of us enjoyed it so much. Great food, great beer and a great evening out! The tandoori mixed grill was delicious! Definitely my new favourite. Really tender, tasty meat! Can't wait to go again...excellent service too! The food is always superb and the staff friendly and helpful. I’m a regular now and take visitors for a treat and they are always impressed too. Never disappoints! Great food, great service- I had the fish thali which is such a good idea for indecisive orderers! We had asked to alter a couple of the dishes but this wasn’t possible as apparently the curry’s were pre-made. I wanted mine without cauliflower but not possible. My partner wanted his dish with the prawns de-shelled but again not possible, he had to change to another dish. Food was good though. Such a great restaurant - Joseph and the team are very welcoming and the food is delicious. I have vegetarian friends who also love eating here so it really caters for everyone! This is a wonderful, friendly restaurant with lots of healthy dishes. I was so pleasantly surprised that no dishes had ghee, we shared the aubergine, chana Masala, saag daal and chicken shashlik. The food wasn't oily and tasted really fresh- I'm looking forward to returning! Good food and atmosphere. Service wasn’t the best but the food made up for that! Relaxed atmosphere, excellent food and friendly attentive staff. What more could you ask! Would definitely recommend. Fab as always, Indian Moment is a stalwart of SW11. Food was excellent, service friendly and prompt. But PLEASE bring back the table cloths and change the back lit signage. Food is very good but the turnaround is very rapid. We had starters and mains, paid and were out in one hour (max, it may have been a bit less). So not the place for a long, slow meal. First time at this restaurant very good & will certainly go again. Joseph took the time to come to the table & ask about our experience which my wife & I both appreciated. We enjoyed good well made Indian food here on our date. The staff are very friendly and the service quick and efficient. We have since ordered takeout from them (we live so close by) as the food is good for our Indian food "fix". Worth a try. Great meal at Indian Moment on Saturday night. Booked last minute for a date with my boyfriend and they had a special 25% off food when booked on opentable. Food was outstanding. Some of the best Indian I’ve had and staff were really friendly. Would defo recommend and will be back again soon! Great food, good atmosphere and efficient pleasant service. Recommended. Fantastic lamb chops, curry is also great. It does get busy on Friday eve so need to book.